It would be wrong to assume that vegan food is somehow more complicated in its preparation than the regular omnivore grub. Enter this simple vegan cannellini bean soup: it’s quick, easy, filling, and oh so heartwarming – a perfect comfort food, I think! And if you pair it with a really simple cucumber-tomato salad as an appetizer, you’ve got a perfect late summer meal! Recently I was on a quest to create a dinner that would consist of simple and quick to prepare soup and salad. The idea of a bean soup with not a lot of other ingredients had been following me for a while. I like a side of braised white beans at Zoe’s Kitchen, but they add a bit too much oil in their preparation, plus I really wanted to recreate them as a stand-alone entree soup. While this cannellini bean soup doesn’t taste exactly like the beans at Zoe’s, it’s nevertheless delicious, oil-free, and very filling. The addition of carrots and celery makes it look a little more festive too! If saving time is not a concern for you, you can use dried cannellini or navy beans, soak them overnight, and then cook the soup in a crockpot with drained beans and the rest of the ingredients. It will be easy to assemble everything in the crock pot, but will take a while (up to 8 hours on low) for the soup to be done. If time saving is a priority, your best bet is to use canned beans, drained and rinsed well. This is what I did to make the soup in these pictures. 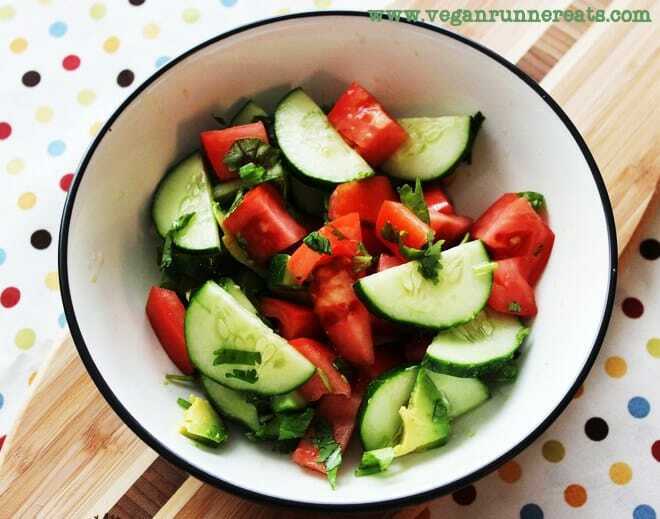 Since things were taking place in the summer, I decided to whip up a batch of this super-easy fresh cucumber and tomato salad. This salad is almost an exact replica of the salad that my mom used to make for our family back when we lived in Uzbekistan and later in Russia. I only slightly adjusted that recipe by adding avocado and lime juice and subtracting unrefined sunflower oil. Serve this meal with the salad first, followed by a warm bowl of soup and some crusty bread. By the way, you can use just about any kind of white beans here: navy, cannellini, Great Northern, etc. If you look through the list of soup ingredients, you’ll see kombu – a Japanese sea vegetable that is supposed to slightly enhance the flavor of beans and make them easier to digest. Kombu is believed to have a number of good-for-you properties, but it doesn’t turn the flavor of your dishes into a swamp-tasting mess, so no need to worry! You can find it in health food stores or online. If you don’t have kombu in your pantry, you can omit it for this recipe. 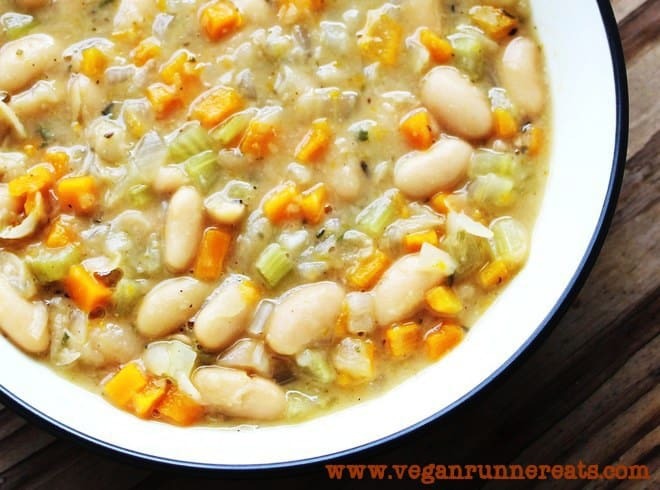 This vegan cannellini bean soup is my definition of comfort food! Serve with fresh cucumber-tomato salad as an appetizer, and some crusty bread for dipping in the broth. In a medium-sized Dutch oven or a thick-bottomed soup pot, heat up 1-2 Tbsp water until bubbly. Add chopped onion, celery and carrot. Cook for 5 min, stirring occasionally, adding more water to prevent sticking. Add minced garlic, cook for another 1 min. Add the rest of the soup ingredients except for salt, pepper, and fresh rosemary (if using dried rosemary, halve the amount and add at this time with the rest of the ingredients). Bring to a boil, reduce the heat to medium-low, and simmer for 20-25 min. Take out about 1/3 of the soup into a bowl, mash with a potato masher until the components of the soup are broken down and look like gravy (this can also be done in a food processor or blender). Return the mashed soup to the pot, add salt, pepper and fresh rosemary, stir well, simmer for another 3-5 min. Just before taking the soup off the heat, check the soup for flavor and adjust seasoning if needed. Take out bay leaves and kombu. That's it! Arrange all of the ingredients equally in 2 bowls. Squeeze some lime juice on top, using more or less to taste. Serve right away. 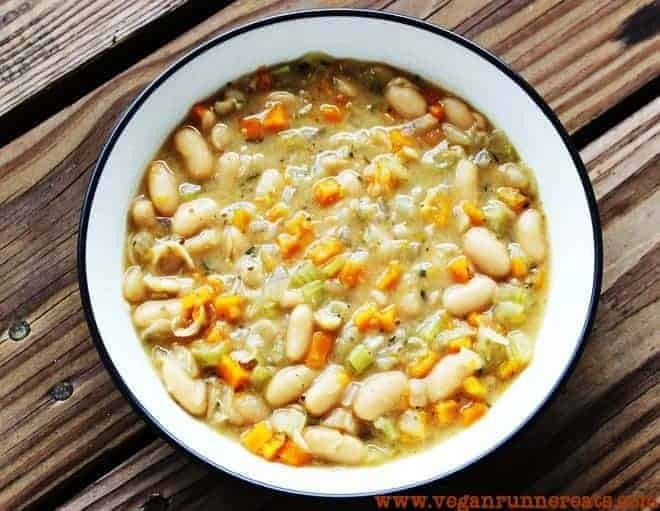 I hope that the goodness of slow-cooked beans and root vegetables in this vegan cannellini bean soup finds its way into your heart! As fall approaches, I will be experimenting with more and more bean soups and seasonal vegetable salads, so stay tuned! Delicious Vegan Eats: Greek Moussaka with Lentils That’s Beyond All of Your Expectations! Tagged cannellini beans, soups, vegan dinner, vegan lunch, whole food plant based diet. Bookmark the permalink. Thank you Lisa, glad you liked it! Wow, adding some white wine sounds like a great idea, I might try it the next time I’m making this soup! I made this soup last week and it was fantastic. It reminded me of the base of a Tuscan style soup. And it rained for many days after so it was perfect leftovers! Can’t wait to try it with different veggies. Oh thank you Kayla! You’ve reminded me that I should make this soup again soon. Sure, Stefania, just skip it! I would have suggested peppers, but I see that you don’t like them either. It shouldn’t be an issue just using onions and carrots.